A variety of dog breeds cover this pattern on this 10-pocket dauber bag. 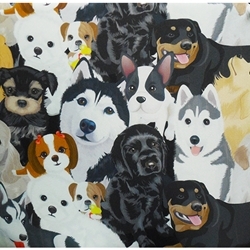 The various dogs are in an artistic collage pattern. Ten dauber sized pockets wrap around the outer edge of this bag. Two beaded drawstrings help to open and close the bag. This dauber bag comes with a complementary matching pouch. Daubers purchased seperately.